Kurt Busiek's Superman: The Third Kryptonian finally hit the mark for me. I enjoyed the first part of Busiek's Superman: Camelot Falls, but found the second volume too esoteric and "talky" for its own good. With Third Kryptonian, however, Busiek offers the super-intelligent Superman that I hope will become his legacy on the Superman titles, in a self-contained story that showcases well the Superman family post-Infinite Crisis. I felt skeptical when Kurt Busiek (with Action Comics writer Geoff Johns) reintroduced Superman's super-intelligence, fearing it would become a way that Super-writers would make Superman super-snotty or super-unrelatable. Instead, Busiek has consistently used Superman's new powers in a way that make the hero a twenty-first century science-fiction intellectual, as when the book Clark Kent is reading is really a hundred books printed super-small. In Third Kryptonian, we see Superman use his intelligence alongside Batman's detective skills. Busiek thankfully avoids the temptation to make one character "outsmart" the other; instead, Superman and Batman work side-by-side, with Batman providing the design for a power-reducing red-sun watch for Chris Kent and Superman providing the miniaturization. Later, we see Batman utilize a number of Superman's technological advances when defending himself from space pirates. Rather than make Superman inaccessible, Busiek writes the super-intelligence so as to make Superman cool--cooler than cool, or super-cool, perhaps. I didn't think I'd like this change in Superman as much as I do, and it shapes Busiek's entire take on Superman in a very positive way. 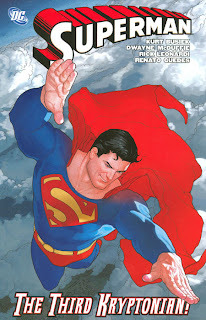 Busiek's story here takes place in the weird space left by the long delays in Geoff John's Superman: Last Son; that is, even though Last Son is mostly a self-contained story, Third Kryptonian takes place somewhere in the middle, while Chris Kent lives with Lois and Clark. Busiek gets the opportunity, perhaps even moreso than Johns, to flesh Chris out. Though at times I felt Busiek went too "cutesy" with Chris's dialogue (and similarly, Supergirl too stereotypically "teen"), he uses the theme of family well in Third Kryptonian to put Superman in a number of fatherly roles. The end of Last Son has much more poignancy now that I've seen Superman and Chris interact to a greater extent here. I will admit that the various minutia of Kryptonian history (often, as it is, shifting and changing) has never held much interest for me; to that end, I found the third Kryptonian herself, Karsta Wor-Ul, potentially the least gripping part of the story, though overall Busiek created an interesting character, and I liked his nods to the Silver Age Superwoman. What I struggled more with here was negotiating what we already know about Superman's history with the new New Earth retcons--Busiek (and Johns) presumably, take great pains to preserve what we know about the established interdimensional Kandor while also giving hints of a new Kryptonian Kandor; at the same time, I was confused by references to a new Kryptonian Doomsday and Eradicator Squad, which Superman understood but that I'm not sure the reader knows anything about. Indeed, even as I had the sense that Busiek found his Superman stride in Third Kryptonian, I was surprised at just how much of this story seemed to be in service of Geoff Johns' upcoming Superman storylines (while Busiek moves over to Trinity). The numerous mentions of Kandor in the story feed right into Johns' "Brainiac" epic; we also see "New Krypton" foreshadowed heavily--even referenced by name--in the two single stories that round out these collections. On one hand I appreciate the cohesiveness of the new Superman universe, making all the stories relevant to a larger picture; on the other hand, I'm left with the feeling that Third Kryptonian short-changes Busiek just a bit, making this story less important than the Johns tale that comes next (though there are worse things). To that end, while I enjoyed the two one-shot stories in the end (one involving the Super-family, one with just Superman and Pa Kent), the foreshadowing of Pa Kent's potential doom here borders on over the top. Not once but twice, Superman and Pa Kent talk about how proud they are of one another and how much they love one another--touching, yes, but Busiek and Johns' point is to show us what a great character Pa Kent is, then why not keep keep the character alive rather than kill him off? I'm not, as you can tell, a big fan of this decision, though I reserve final judgment until I actually read the story in question. All in all I liked Third Kryptonian a lot, mainly for Kurt Busiek's portrayal of Superman, and my guess is that it'll turn out to be my favorite of Busiek's run. Overall I'm pleased with the Super-universe that Busiek, Johns, and new writer James Robinson are building, and I think it portends good things for the Superman titles. Next up: Batman: The Black Glove. Join us! Keep in mind that when written, they were set-ups for stories Geoff and I were both going to be involved in writing. I didn't set up Kandor for Geoff, I set it up for both of us. And then wound up departing, leaving it in Geoff and James's hands to be followed up on. Kurt -- That's an important distinction, and I appreciate your clarifying it. It's an amazing and unique aspect of the comics medium how much it becomes a relay race sometimes -- a writer takes a story part of the way, and then hands the baton off to another to run the same race. I've very much enjoyed, by the way, your use of Superman's super-intelligence to add some science-fiction elements back to Superman (the miniature book on the plane in Camelot Falls Volume 1 is still a favorite!). That Superman could hold his own with Batman in this tale -- each of them intelligent, but in different ways -- was a great moment.